Writing is the first thing I remember doing as a child outside of any external influence or direction. As soon as I could pick up a crayon and start scribbling I did, trying to put down what was in my head. I wouldn’t realize writing was a profession I could have until much older, when I was in middle school and the guidance counselor came to my class to talk to us about what we wanted to be when we got older. Writing was just so wonderful to me that I didn’t think I could make a life out of it. My parents had jobs, very hard jobs that made them tired and not a lot of money. So I thought that’s what I would have to do. Have a job I just didn’t like. Though it took me eleven long, hard years to get a publishing contract and even then there’s no Stephen King money coming my way, I love writing and really there’s nothing else I’d rather spend my life doing. How did you get the idea for The Summer that Melted Everything? The Summer that Melted Everything started life as a title. It was one of those Ohio summers that I just felt like I was melting and thus the title and idea was born. Did you know where you were going with the story from the beginning or did it develop as you wrote it? I did not know where I was going with the story at all. For me, the story develops as I write. I always start a new novel with two things. The title and the first line. I never outline or plan ahead. Writing is very spontaneous for me. It’s what is in my head that moment I’m sitting in front of the laptop typing away. I do this from beginning to end, and then draft and draft, filling in those cracks and crevices and I even surprise myself the turns the story takes, and the roads the characters ultimately go down. You've written other works before, but this is your first novel, was the transition from forms like poetry and scripts to a novel difficult or did one play of the other? 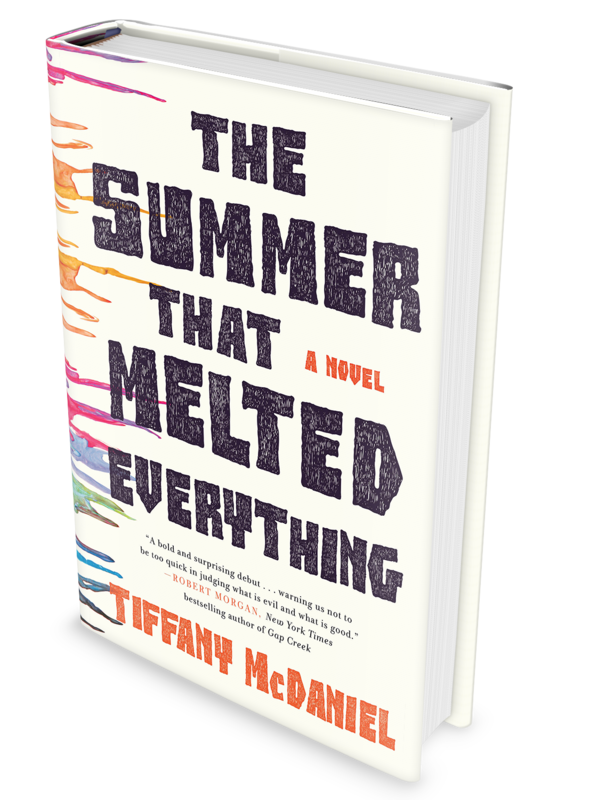 The Summer that Melted Everything is actually not my first novel. It’s my first published novel, but it’s the fifth or sixth novel I’ve written thus far. And it’s one of eight completed novels. I do love writing novels, probably more so than the other forms I write, like poetry and scripts. I do tend to look at my poems and hope to one day turn them into novels, because I just always see so much story behind everything. The novel form is pure enjoyment for me because unlike other forms, you get to step into an entire life with these characters. You get to hold on to them a bit longer than a script or a poem allows as they’re generally much shorter works. So the distance you get to travel with the characters and their story, is mile after beautiful mile with a novel. Could you describe what your publishing experience was like? I wrote my first novel when I was eighteen and didn’t get a publishing contract until I was twenty-nine. That first novel I didn’t get an agent for until I was in my mid-twenties and then it went on submission to publishing houses sometime I was twenty seven, I believe. The feedback from the editors was wonderful, but for many the novel proved to be too dark or too long for a debut. Literary fiction, like the genre I write, is really difficult to get publishers to take a risk on as there isn’t as high of a return on profit as there is for commercial fiction. So I got busy and wrote all the novels I should have been writing during the course of those years I was trying to get my first novel published. Of those novels, I thought The Summer that Melted Everything was the strongest contender. It went on submission and the rejections started to roll in. I was certain I wasn’t going to get an offer and then the offer came in from St. Martin’s Press. I had no idea how to feel at the news. I was stunned. Eleven years of struggling to get published. Years of rejection and fear I’d never be the published writer I’d always wanted to be. I still can’t believe I’m about to see my book on the shelf and I feel for writers still on the journey to publication. To them, I say it will happen for you! Never turn your back on your dreams. Never give up. If you had to cast your main characters in a movie or play, who would get the parts? I definitely have my picks because I love film so much and hope to one day see The Summer that Melted Everything translated to the screen. I’d love to see Kate Winslet as Stella, Anthony Hopkins as older Fielding. I think the younger characters of Fielding, Grand, and Sal will have to be new comers due to their ages. But I do really hope one day I am fortunate enough to get to see the story come alive on the screen. I have my popcorn ready. Fielding Bliss has never forgotten the summer of 1984: the year a heat wave scorched Breathed, Ohio. The year he became friends with the devil. Sal seems to appear out of nowhere - a bruised and tattered thirteen-year-old boy claiming to be the devil himself answering an invitation. Fielding Bliss, the son of a local prosecutor, brings him home where he's welcomed into the Bliss family, assuming he's a runaway from a nearby farm town. When word spreads that the devil has come to Breathed, not everyone is happy to welcome this self-proclaimed fallen angel. Murmurs follow him and tensions rise, along with the temperatures as an unbearable heat wave rolls into town right along with him. As strange accidents start to occur, riled by the feverish heat, some in the town start to believe that Sal is exactly who he claims to be. While the Bliss family wrestles with their own personal demons, a fanatic drives the town to the brink of a catastrophe that will change this sleepy Ohio backwater forever.